Tilted Horizons: The Obama/Biden train off to D.C.! The Obama/Biden train off to D.C.! 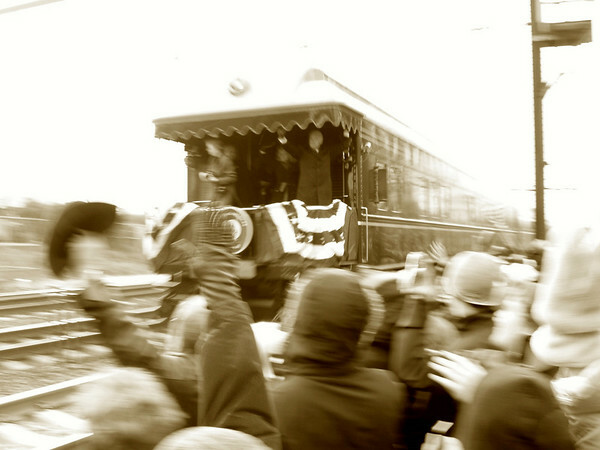 Here's the Obama/Biden train as it passed thru Newark, Delaware today on the way to D.C. for the Inauguration. That's Delaware's Joe Biden waving; Barack (being a Harvard man) stayed inside where it was a little warmer than the 18F outside temp. The custom blurry effect is courtesy of my frozen camera hand.